(Phys.org)—Men whacked punching bags for a University of Utah study that suggests human hands evolved not only for the manual dexterity needed to use tools, play a violin or paint a work of art, but so men could make fists and fight. Compared with apes, humans have shorter palms and fingers and longer, stronger, flexible thumbs – features that have been long thought to have evolved so our ancestors had the manual dexterity to make and use tools. "The role aggression has played in our evolution has not been adequately appreciated," says University of Utah biology Professor David Carrier, senior author of the study, scheduled for publication Dec. 19 by the Journal of Experimental Biology. "There are people who do not like this idea, but it is clear that compared with other mammals, great apes are a relatively aggressive group, with lots of fighting and violence, and that includes us," Carrier says. "We're the poster children for violence." Humans have debated for centuries "about whether we are, by nature, aggressive animals," he adds. "Our anatomy holds clues to that question. If we can understand what our anatomy has evolved to do, we'll have a clearer picture of who we were in the beginning, and whether aggression is part of who we are." Carrier agrees that human hands evolved for improved manual dexterity, but adds that "the proportions of our hands also allow us to make a fist," protecting delicate hand bones, muscles and ligaments during hand-to-hand combat. As our ancestors evolved, "an individual who could strike with a clenched fist could hit harder without injuring themselves, so they were better able to fight for mates and thus more likely to reproduce," he says. Fights also were for food, water, land and shelter to support a family, and "over pride, reputation and for revenge," he adds. "If a fist posture does provide a performance advantage for punching, the proportions of our hands also may have evolved in response to selection for fighting ability, in addition to selection for dexterity," Carrier says. So Carrier and study co-author Michael H. Morgan – a University of Utah medical student – conducted their study to identify any performance advantages a human fist may provide during fighting. The first experiment tested the hypothesis that humans can hit harder with a fist. 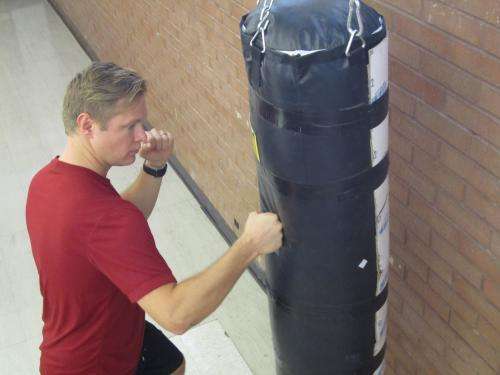 So, Carrier and Morgan had 10 male students and nonstudents – ages 22 to 50 and all of them with boxing or martial arts experience – hit a punching bag as hard as they could. Each subject delivered 18 hits, or three of each for six kinds of hits: overhead hammer fists and slaps, side punches and slaps, and forward punches and palm shoves. The bag was instrumented to allow calculation of the force of the punches and slaps. To the researchers' surprise, the peak force was the same, whether the bag was punched with a fist or slapped with an open hand. However, a fist delivers the same force with one-third of the surface area as the palm and fingers, and 60 percent of the surface area of the palm alone. So the peak stress delivered to the punching bag – the force per area – was 1.7 to three times greater with a fist strike compared with a slap. "Because you have higher pressure when hitting with a fist, you are more likely to cause injury" to tissue, bones, teeth, eyes and the jaw, Carrier says. The second and third experiments – which each also involved 10 male subjects – tested the hypothesis that a fist provides buttressing to protect the hand during punching. To do that, the researchers measured the stiffness of the knuckle joint of the first finger, and how force is transferred from the fingers to the thumb. Both measurements were made with normal, buttressed fists or when partial fists were not buttressed. 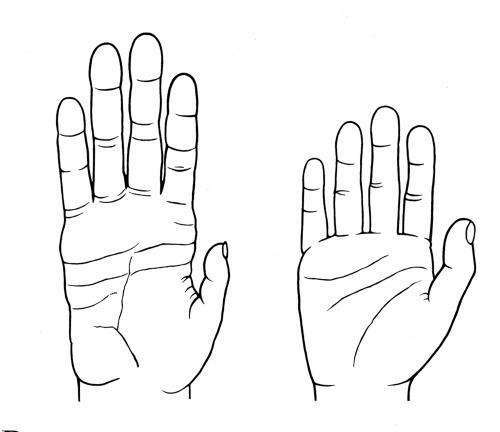 Humans buttress – strengthen and stabilize – fists in two ways that apes cannot: The pads of the four fingertips touch the pads at the top of the palm closest to the fingers. And the thumb wraps in front of the index and middle fingers, and to some extent the ring finger, and those fingers are locked in place by the palm at the base of the thumb. To measure stiffness of the second knuckle joint, the study's 10 male subjects slowly pushed a pressure transducer, with clenched fists or with fingers bent but the fist unclenched. Researchers measured the force and also how much the index finger flexed. Force transfer from fingers to the thumb also was measured, but in this case the subjects got in a one-handed pushup position, with their knuckles pushing down on a block placed on a different force transducer. The second and third experiments found that buttressing provided by the human fist increased the stiffness of the knuckle joint fourfold (or reduced flexing fourfold), and also doubled the ability of the fingers to transmit punching force, mainly due to the force transferred from the fingers to the thumb when the fist is clenched. "Because the experiments show the proportions of the human hand provide a performance advantage when striking with a fist, we suggest that the proportions of our hands resulted, in part, from selection to improve fighting performance," Carrier says. Carrier notes that besides dexterity and aggression, a third theory to explain the proportions of human hands also may be true: Natural selection for walking and running among human ancestors led to shorter toes and a longer big toe – and the responsible genes also led to shorter fingers and longer thumbs. Apes' elongated fingers and hands evolved so they could climb trees. "The standard argument is that once our ancestors came out of the trees, the selection for climbing was gone, so selection for manipulation became dominant, and that's what changed the shape of our ancestors' hands," Carrier says. "Human-like hand proportions appear in the fossil record at the same time our ancestors started walking upright 4 million to 5 million years ago. An alternative possible explanation is that we stood up on two legs and evolved these hand proportions to beat each other." Carrier says that if manual dexterity was the only driving force, humans could have evolved manual dexterity with longer thumbs without the fingers and palms getting shorter. But, he adds, "there is only one way you can have a buttressed, clenched fist: the palms and fingers got shorter at the same time the thumb got longer." — No ape hits with a clenched fist other than humans. Gorilla hands are closer in proportion to human hands than are other apes' hands – a paradox since chimps are better known for tool-making and dexterity. So Morgan and Carrier also believe aggression was a factor in the evolution of gorillas' hands. — Humans use fists as threat displays. "If you are angry, the reflexive response is to form a fist," Carrier says. "If you want to intimidate somebody, you wave your fist." — Sexual dimorphism – a difference in body size between males and females – is greater if there is more male-male competition in a primate species. "Look at humans and gorillas. The difference between the sexes is mainly in the upper body and the arms, and especially the hands," Carrier says. "It's consistent with the hand being a weapon." Carrier and Morgan write that the human hand is paradoxical. "It is arguably our most important anatomical weapon, used to threaten, beat and sometimes kill to resolve conflict," they say. "Yet it is also the part of our musculoskeletal system that crafts and uses delicate tools, plays musical instruments, produces art, conveys complex intentions and emotions, and nurtures." "More than any other part of our anatomy, the hand represents the identity of Homo sapiens. Ultimately, the evolutionary significance of the human hand may lie in its remarkable ability to serve two seemingly incompatible but intrinsically human functions." Fascinating and very plausible, yet not something that'd ever occurred to me before. In retrospect one notices that many animals have evolved to fight in stereotypical ways, so why not us? Making a fist certainly seems instinctive. Overall, there's some merit here. "No ape hits with a clenched fist other than humans. Gorilla hands are closer in proportion to human hands than are other apes' hands – a paradox since chimps are better known for tool-making and dexterity. So Morgan and Carrier also believe aggression was a factor in the evolution of gorillas' hands." That's a red herring, because Chimps are also more aggressive and fighty than Gorillas. Why haven't chimps selected for shorter hands if the reason is for fighting? I'm thinking that among non-human apes, they still have the advantage of a massive jaw and fangs, (which was evolved out of humans), meaning there should be reduced selection for fists in apes with deadly jaws. Gorillas may have more human like hands for some other reason. If you hit with a fist wrong, you break bones, even if you hit correctly you don't want to hit hard bone like the skull. I've taught punching and people generally start off punching wrong. Boxing gloves were designed not to protect someones head, but to protect fighters hands. It is extremely hard to break a bone or injure your hands if you slap or hammer fist. I don't think that the hand is designed to punch, but that punching the way we do was to minimize the risk or damage to the hand. I knew a professional kickboxer who was also a bouncer. He hit someone with a closed fix in the head and broke his hand. Next day he got into another fight, this time he just kicked them in the head. Why? He didn't want to risk breaking his other hand. All in all, I think this scientist is another goofball trying to prove evolution in a stupid way. But hey, he got paid for his observations to promote His agenda. Actually, maybe I'm wrong. Maybe relatively speaking, accounting for size, Gorilla have less lethal jaws, because they eat a more vegetarian diet than Chimps, so even though Chimps fight more, the Chimps are using their fangs more than Gorilla's do, meaning a lesser selection for impact resistant hands than in Gorilla. Of course, we can answer that by observing fights of the respective species. Do Gorilla thump each other more when they fight? Do they bite each other as much as Chimps do? I am very skeptical that the fist is highly important in hand evolution. A hand that is holding a rock or a club or a spear is much more devastating than any fist. Any human who tries to fight a chimpanzee or a gorilla with his bare fists is going to get killed. No cave man brought down a mammoth or a cave bear with his fists. The evolutionary importance of the fist is tiny compared to the dexterity of the hand in making and wielding tools. I agree with Shakescene21... The whole story is VERY speculative, as most studies trying to find the PARTICULAR selective pressures behind adaptive traits.. To me as a developmental biologist, it is more important to understand what chnages in the genome are behind anatomical changes, which is less speculative than spending effort and money investigating something very volatile like "is the human hand for better fist or better tool-handling". What matters more is "what genetic factors brought a hand with such shape". what a load of crap. Our fingers got shorter when we stopped hanging from trees, and moved down onto the land. BTW: the DNA code to grow a "hand" is even in a snake believe it or not. Sometimes chance DNA copy mistakes make one single error that can turn on the code to grow an entire lizard leg off the side of a snake. Our hands are the shape they are so that we can grasp objects that we pick up off the ground, and work with them. People fought with sticks in prehistoric times to it's more likely that our fists fit around a stick rather than to make a fist. Shakescene21 is right: "A hand that is holding a rock or a club or a spear is much more devastating than any fist". Humans (excluding some spitting snakes) are only species able to kill or main another at a safe distance thanks to our ability to accurately throw stones. The handrawings are great. What kind of restriction is there on their copy? Could I upload them on Wikimedia? Edit. Just seen the credits in the caption. Denis Morgan from the university of Utah. that's what happens when you try to apply "research" done on punching bags. there's a reason boxers often break their hands when fighting without gloves - our hand bones are too weak for the force that they are supposed to transfer. hitting a bag is fine, but hitting someone, the chances of an injury that will put you out of hunting for weeks. I haven't read the paper, but it is a phylogenetically non-plausible hypothesis. The common ancestor apes before the gorilla and chimp splits had a generic monkey hand, which we have retained. Both the gorilla and the chimp has independently developed separate knuckle walk hands for different reasons. The gorilla with its leaf digesting huge stomach is too heavy in the upper body for bipedalism. It has a skeleton sustained stiff wrist knuckle walk correlated with the massive body. The chimp with its tree life adaptation is too weak in the lower body for bipedalism. It has a ligament sustained flexible wrist knuckle walk correlated with the tree adaptation. @ clay ferguson: Our fingers got somewhat shorter, they weren't long in our ancestors to begin with, see Ardipithecus. I'm no anthropologist, this is mainly my astrobiology interest speaking. But I believe it has recently been noted that it is much underappreciated how specialized all current apes are. But the Homo lineage actually retaining many generic characteristics where the rest isn't! The hands may actually be the best example of that, but the gorilla & chimp bipedalism problems is another - gibbons can walk akin to what we do, see papers and youtubes on that - and they are correlated to the knuckle walk hand constructions. It is perhaps better to study the chimps, gorillas and 'tangs as specialized in relation to us (and gibbons), instead of us as specialized in toto. Probably has to do with chimps ability to climb much better than a gorilla. Exactly, they spend a lot more time in trees. Gee Deadbolt, it doesn't matter how aggressive chimps are their palms and fingers aren't going to get shorter. They live mostly in trees. Such a load of bull! Punching didn't become poplar among the masses until Hollywood used it as a device in TV shows and movies. Kids coming to North America from Europe in the fifties and sixties were appalled by the "custom" of striking the face with the fists when engaged in playground fights. Conventional fighting takes the form of wrestling, with the winner pinning the loser to the ground by the shoulders. Our hands are adapted to forming fists because they are natural gripping tools for spears and cultivating tools.